The Qur'an is filled with wisdoms about every aspect of life from praying and sleeping to eating and drinking. However, no matter how powerful the wisdoms of the Suras we read, sometimes the suggestions of advertising and media ring stronger in our minds. O children of Adam! Attend to your embellishments at every time of prayer, and eat and drink and be not excessive; surely He does not love the extravagant (Qur’an 7:31). O you who believe! eat of the good things that We have provided you with, and give thanks to Allah if Him it is that you serve (Qur’an 2:172). The stomach is the source of many diseases (Hadith). However, oftentimes, advertising or articles in journals can convince people to forgo what they know. This is apparent in the case of the health benefits of wine. Some Muslims, reading the articles about health benefits of red wine decided it was wise to try this medicine (see The Misleading Health Benefits of Wine by Dr. Wagdy Sawahel). However, studies later showed that grape juice was actually healthier than the red wine. Similarly, soy producers have recently touted the benefits of soy as a healthy, estrogen balancing, allergy-free bean. Yet, researchers are beginning to find that soy is harmful in many people and that excess soy is harmful to everyone. Although Muslims are told in the Qur’an and Hadith that breast milk is the best milk for babies, many Muslims have given their children soy milk on a regular basis. And although Muslims are told that fresh cow’s milk was one of the Prophets favourite drinks, they have still decided to follow the trend away from milk products and drink soy instead. Last, but not least, even though Muslims are told not to eat or drink anything in excess, some people have adopted soy products for medical reasons and are consuming three or more servings a day. It is common knowledge that soybeans are loaded with plant compounds that mimic estrogen, a female hormone. Many post menopausal women use soy products to help control hot flashes and other problems caused by hormonal imbalances. However, this same estrogen surge can wreak havoc in the systems of young children, men and even some women who already have sufficient estrogen levels. Some studies on the effects of soy products on humans have been in progress for 40 years. Researchers are now examining the brain tissue of the deceased and there are many recent studies done on animals. They noticed that birds fed soy developed their adult plumage at two months old instead of the normal 18 months. At first this was an advantage because the young chicks could be marketed better with their full adult colour. Then they noticed that the early maturing, soy-fed birds aged prematurely and died young. This caused much consternation among bird handlers, for they also noticed a great increase in growth disorders, thyroid problems, infertility, and tumour growth. Researches then started asking, “If soy does this to birds, what is it doing to us?” National health agencies and physician associations of some countries have warned their populace to exercise caution in using soy based infant formulas (Malloy). In the U.S., two of the Federal Drug Administration’s (FDA) own researchers, Daniel Doerge and Daniel Sheehan, have stepped forward to protest their own agency’s allowance of health claim labelling regarding the effects of soy protein on coronary health. In a letter to the FDA, they cite their deep disturbance over potential risk to the public by the FDA’s failure to require that the same safeguards be put in place for soy use as for estrogenic (prescribed hormone substances) and goitrogenic drugs (thyroid medication), They suggest that people be informed of the risks and be under a physician’s care while using it (White). Preliminary studies on children indicate even more disturbing news. Studies show that children given soy formula go through puberty much earlier than children who were not fed soy products because the phytoestrogens and isoflavones in soy act like a hormone in the body, causing the infant to have hormones like the adult body. A 1994 study done in New Zealand revealed that, depending on age, potency of the product, and feeding methods, infants on soy formula might be consuming the equivalent of up to ten contraceptive pills a day (Ross). Phytoestrogens (substance in soy) are now strongly implicated, through research, in thyroid disorders, behavioural and developmental disorders and cancer. Theodore Kay of the Kyoto University Faculty of Medicine noted in 1988 that “thyroid enlargement in rats and humans, especially children and women, fed with soybeans has been known for half a century” (Mercola). However, the hormone issue is not the only concern. Research now in progress strongly ties aggressive behavioural problems in children to soy. Soy formula has manganese levels that are 50 times higher than the level found in mother’s breast milk (Ross). Research is now showing that high levels of manganese found in soy beverages may be neurotoxic to babies, causing brain damage. These studies suggest a correlation to the dramatic increase in Attention Deficit/Hyperactivity Disorder (ADHD) and violent behaviour seen in adolescents today (Mercola). Allergies are also a growing concern. Soy is one of the most allergenic foods in modern diets. It is reported in several research reports to contain at least 30 allergenic proteins. Many prepared foods from MSG to crackers and cookies, to frozen fish sticks, and T.V. dinners, drinks and many things in-between contain soy. 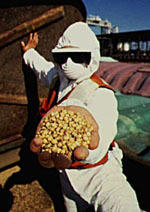 In addition, many soy products are listed as natural ingredients or natural flavourings (Malloy). Researchers also believe that the trend toward lower male fertility may be due to environmental estrogens, including the soy phytoestrogens. There is strong evidence that soy phytoestrogens inhibit an enzyme which is required for the synthesis of testosterone and the development of the CNS-gonadal axis (White). Much research is now being done to determine the effects of soy on male animals (even male insects) of all sorts. Research with animals and insects from the grasshopper to the cheetah, are showing that soy affects males by making them less confident, less aggressive, indecisive, show less sexual interest, lower sperm count and in some studies less everything male. White, Dr. Leonard. “Uncovering the Truth About Soy.” Soy Online Services. 2002. Malloy, MH. “Soy Based Formulas.” CDC Database. 1999..
Ross, Brian. “The Other Side of the Story.” ABC News Online. June 9, 2002. Mercola, Dr. Joseph. “The Truth about Soy.” Mercola News. 2001.